Have you ever played 20 questions? We think we can guess what you're thinking in 29 questions! Maybe we can, maybe we can't but why don't you find out? 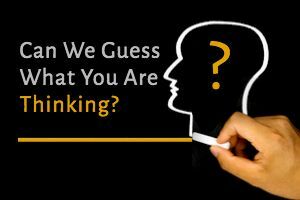 To guess what you're thinking we'll ask you various questions to help us home in on your thoughts. Or maybe we'll use magic questions that will trick your brain! Guessing what you're thinking is going to be hard. We admit it. You could have any of a thousand thoughts! Why not give it a try and find out? Take the quiz!